This interview features Albert describing his work at Salters’, having followed in the footsteps of Charles, his father, who was varnishing at the firm. He describes, amongst many things, the largest steamers being used as hospital ships during WW2, building Niceia for OUBC [see image], and working on the college barges, which ultimately led to him leaving to become a university waterman. Nevertheless, he continued to work for Salters’ during the summers, when there was no rowing, and he returned to the business in the 1980s, when he had retired from university work. Simon Wenham: When did you start working for Salters? Albert Andrews: I did a little bit when I was a school boy. A little bit as a mate on the steamers. You know in the summer holidays. Do you know when that was, what …? Well, no, that was before 1936. When did you start full-time at Salters? Did you have much contact with the Salter family? Oh, I knew the Salter family very well. Back from the very old Salters. You know, George Salter and all those. Was George in charge when you started? Well, there was another one: Frank. But George was the eldest – he was senior. As there was more than one family member, was it the senior one who was in charge? Well, ‘e was the senior one, but I mean, they all worked together – brothers, it was Salter brothers. Did they have their own offices each one? Oh yeah. That’s the office block, over where they got flats now…and they had loads of buildings – the building shops an’ that. Did each Salter have their own office? Oh yeah, they all had offices. Did you know Lord Salter at all? Yes, yeah, but ‘e wasn’t, ‘e wasn’t connected with the firm. ‘e was…well ‘e was MP. Do you know if he was quite useful for the company, did he do…? Well ‘e came to the meetings. ‘e was, you know, the…they ‘ad lots of board meetings. And when George Salter died, did Frank Salter take charge of the company? Yeah, Frank Salter. Yeah, there was Frank and Arnold. But Arnold didn’t have much to do with the boat building business. ‘e did more the catering on the steamers. And then it was Arthur after that was it? Arthur, yeah, and his son, John. Do you know Hubert Salter or Jack Salter? Hubert Salter. Yes, I knew Hubert. I didn’t know Jack. I didn’t know there was a Jack. Do you know what Hubert Salter did? Yeah, ‘e come into the firm as part Director, you know. And were the different Salters quite quiet men or were they quite a ‘presence’? They were very good. They always walked round the firm every day and chat to everybody – very understanding firm. Some of the Salters were religious. Do you know if that affected the firm? No, no, no. There was only one that was really religious. So the Salters were obviously in charge. Did they have managers that organised…? Well. Yeah, they had managers of different departments you know. Was it quite strict control or were people generally left to their own work? Ah, they weren’t too bad. They were a good firm actually. A very good firm. When you started in 1936 what were you doing then? I went to the boatbuilding shop for the winter and on the steamers in the summer. Was that a seven-day week? Did that put a strain on relationships? Did you look forward to going on the boats in the summer after working in the winter? Oh yeah. Nice change, you know. Did they pay the same in the summer and the winter? I couldn’t tell you off hand. It didn’t make any difference to me. Were the workers in any unions like in the Morris works? No, no. They had no unions. No you know how many staff there were? Oh, I couldn’t tell you…enormous staff. Course they had eighteen steamers and they all had a crew of four. That was in the summer, of course. They didn’t work all year round. Some were only, you know, only worked in the summer. Did most of the seasonal staff stop working and find other jobs in the winter? No, most of the steamer staff stayed on, as they had to clean the boats. Do you know where most of the workers were from? Were they local or did they come from all over the place? Well, most of them were local, but course we had boats down at Windsor and a lot of the skippers were down at Windsor. And we ‘ad boats…we bought boats from down-river (London) and they ‘ad the people from there. You know the skipper an’ that. In the 1950s quite a few workers came from Southampton and Wales. Do you know why that was? Well, we ‘ad a few, but not many really. I know about the Dunckleys and the Andrews. Do you know if there were any other families working on the firm? Well, I knew Bryan and Bill Dunckley, as they were my mates – first of all. They started with me. Did everyone in the firm know each other well? Oh yeah…every steamer ‘ad to go through Board of Trade and they ‘ad to be cleaned out thoroughly and painted inside, as well as outside. Did people use the term ‘Salters navy’ or another term? Not really, no. O.K.S. they was known as (Oxford and Kingston Steamers). Do you know if the Morris Works or Pressed Steel caused Salters’ trouble in getting staff? Was it considered to be a good job to have (compared to other jobs)? I dunno. I had four brothers who all started working for Salters’. Did the job have good job security? Was it a ‘job for life’? Oh, yeah. You never sort of got the sack from Salters’. As long as you did the work, that’s all they were worried about. I also read there was a sick club at some stage where workers paid into a fund. Do you join that? No. Well, I didn’t join that. Were there any social activities that the staff went on or was it just work and that was that? Were there any staff outings or parties? Yeah, we ‘ad staff outings. End of the summer season, used to have coaches and go down. Were there any staff clubs or anything like that? Sports clubs or anything like that? So you started on the boats where you skippering then or crewing or…? I was crewing first. Yeah, I didn’t take over as skipper ‘til I was seventeen. Was that quite young to skipper? Well, I weren’t skippering the big boats then. We had two smaller boats the Iffley and Leander first (40ft passenger launches – open ones). Because they were smaller boats, did you sleep on board of them as well? No, they were all open. No, no. I didn’t need to sleep on board as I was born along here: Jubilee Terrace. That’s where I lived [pointing to the other side of the river] ‘til I got married. So you were seventeen skippering those. Did you then move onto bigger boats then? Do you remember when that was? Was that quite normal for crews to become skippers a few years later? You worked as a mate first and then when a skipper died, you took over. Was that with Bill when you started? Bill and Bryan both started with me on the small boats. Did you actually build boats as well? Oh yeah. 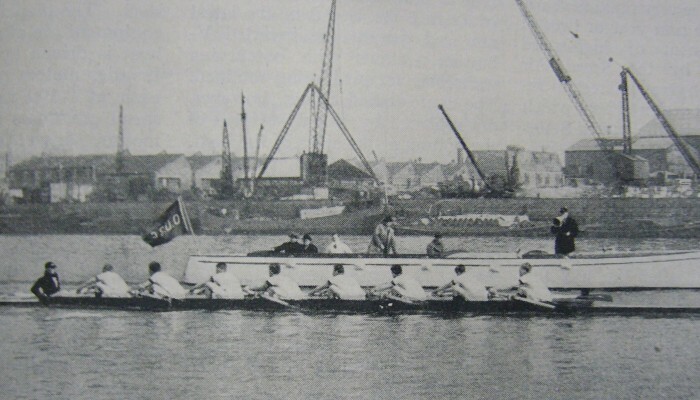 In 1936, we built a boat called the Niceia, which was a gift from Lord Nuffield for Oxford University Boat Club. 50 foot long. Built in workshops over here in Brook Street and I worked on there, you know, for quite a while. It [the name] was something to do with victory. Greek meaning of victory or something. It was a present from Lord Nuffield. ‘e gave ‘em a thousand pounds to have it built and it cost about 680, I think and that was a long time ago. Course we ‘ad Morris Engines. Yeah, we had twin Morris Commodores in there. What was your role in the boat building? Mixed really. Cabin cruisers…mixed work really. I mean, building cabin cruisers and things like that. Built our own boats. We ‘ad a fleet of cabin cruisers and we built our own boats. Do you know about the university college barges? Being a bargeman. Barges…looking after the barges for the colleges. Was that doing repairs and things or…? No, no, we didn’t do repairs – just had the barges to look after. Only in term of course for the undergraduates who come down to go rowing. Was that a good job? Not bad, not bad – average. Were the rowing boats kept on the barges? No, no. The barges weren’t big enough for that. Do you know if the rowing boats we built were leased or sold to the colleges? They used to lease them for about three years and then they handed them down. But they paid for them on a rental, you know. I know from the inventories that we owned absolutely loads of boats. Do you know where they were all kept? We ‘ad a lot of boat building stores up at Folly Bridge. How did the war affect what the staff were doing? They built lots of landing craft. In September, three of Salters boats went down to London and were hospital boats. The Mapledurham, Cliveden and Grand Duchess and I worked down there as a mate for a while…during the war. Got some bombing in as well! Really? Were they just going up and down the tideway taking…? No, they were built as passenger…as ‘ospital boats. They ‘ad a full staff on there: doctors, nurses – everything! Did they just keep the saloon as it was or did they change…? Do you know how the landing craft were transported? We took a lot by river. We took a lot down at a time. I always went down with ‘em. Coz we built steam pinnaces as well. When they built the steamers, did they use the normal workforce or did they get gangs of people in? They built all their own their selves down the slipway. They ‘ad quite a big workforce themselves. They didn’t just employ them especially. Did you know someone called Baker? I don’t know. I don’t know the history of him. Was he in charge of the slipway or was it just the steamers? Well, I mean, ‘e was the foreman down there. That was it as far as I was concerned, but they ‘ad several foreman. Some were engaged in pulling the steamers out up the slipway. You used to put six steamers, three on each side and the big ones up the middle. When they built boats, were people paid by piecework or was it just the weekly wage? I heard the slipway burned down. Do you know when that was? Do you know when the Brook Street workshops were built? Oh, the workshops. I don’t know when they were built. I don’t know when they were built. Course they had these big concrete buildings, which is now turned into flats. That’s where we built the Niceia there. Also we had quite a few houses around…? Oh, they owned all Buckingham Street on this side and I notice they built their own. And they all look the same, you notice, that on this side all the way up on this side. Was it the Salters’ workforce that built them or did they just pay for them? They built their own. They had a terrific staff. They built their own workshops. There’s one in Brook Street about to be pulled down and turned into flats, that’s what they’re doing there, see. So when did you stop working for Salters? So you worked for Salters for fourteen years? Well, then you see, on vacation I used to do some work for Salters’ skippering, when there was no rowing. That was sixteen weeks’ vacation, you see. That worked out very well. You could do quite a bit. I retired in 1987 and I got work back at Salters’. I was only 65 and I could carry on. So during my retirement I worked for Salters ‘til 1992, when I finished. Was the pay ok at the Salters? Quite good. Quite good. Reasonable…Never good, but liveable. After Iffley and Leander which boats did you skipper? Did you have your own boat? No, no no. Anything. Part-time. Well, any boat that required a skipper. Would you sleep on board? Well, no, no. I only lived around here. I was born over Jubilee Terrace. Slept on board, if I was away – if we were in Windsor or something. Then later, of course, they got transport and we used to come home at night. How were the racing boats that were built transported to their destinations? They were in a lorry. You could carry six racing boats on the lorry. 60ft long – a good driver needed. Do you know when Salters’ stopped building racing boats? Oh. A long time ago. My nephew [Graham] worked for them for quite a while. So you also had brothers who worked for the firm? Did your father work for the firm? My father worked for Salters’ for forty years, before I did, of course. But he was still there coz ‘e worked with me. General varnishing…varnishing of boats and doing ‘em up in the winter. Pleasure boats. We ‘ad fifty-one camping punts, with oars and canvas covers. So we must have had lots of different staff doing different things…. Oh yeah. We ‘ad our own blacksmith. All your engineers and everything. Coz each boiler ‘ad to be cleaned out and de-scaled inside before the Board of Trade passed it. If the Board of Trade didn’t pass it…! Same with all the engines. They were stripped down and laid out and the Board of Trade came and examined them all, bearings and everything else, you know. They all ‘ad to be passed by the Board of Trade. 1: It was actually George Herbert, who became the Rector of St Sepulchre. 3: Baker, who built the craft, did actually supply his own labour. 4: There was a fire to the Donnington Road yard in 1920. It was not caused by the suffragettes, although a rival’s yard (Rough’s at Long Bridges) was targeted by them in 1913, which may have been where the rumour came from.